Welcome to Treasures Forever... Michigan's Amish Furniture Store! A hearty Michigan welcome from all of us at Treasures Forever, your soon to be favorite Amish furniture store in Northern Michigan! You'll find three floors of Amish crafted quality furniture. We offer items for the kitchen, bedroom, living room and everywhere in between! The selection of wood species and stain colors are endless. Plus, we specialize in custom design...so if you can dream it, we can draw it...and they can build it! Treasures Forever - well worth the drive! As you look at the many products on our site, please recognize this is only a sample of the hundreds - if not thousands - of Amish-made products that we offer. While not all products you'll see on our site are in our showroom, you may order any of them in your favorite hardwood species and finish! Do you see something you like or do you have more questions? Just give us a call! We can tell you the specifications, features, options, and many other details about what you see. It is important to realize that while our photos show the beauty of this fine furniture, you can only appreciate the quality and functionality of Amish furniture by touching it, sitting on it, and simply seeing it in person. We invite you to visit our store and see all we have to offer! Don't miss the Red Barn Hobby Shop inside our store. The perfect stop for radio controlled model airplane enthusiasts! Some of your favorite models and accessories, all right here! Featured at Treasures Forever... Perfect for the Man Cave! 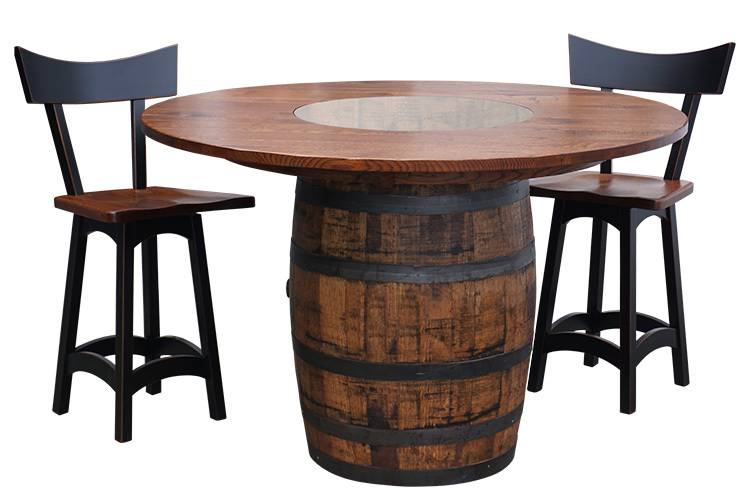 We are pleased to feature the "Barrel Table & Stools." While true it's perfect for today's Man Cave, it's also been a favorite throughout the home! Check it out today at Treasures Forever... Michigan's Amish Furniture store. © 2017-2018. Treasures Forever Amish Furniture. All Rights Reserved. Website Design & Development by One Meeting Street.